Enhanced PSTEC Included as Standard! Also available: "Success With PSTEC & PSTEC Positive On CD"
What will you get on this CD? As well as being very convenient, this is somewhat different from the free downloads and it comes with more included as standard. Better than the download with MORE INCLUDED as standard. Comprehensive instructions brought "bang up to date" with the very latest additions. Not just two but THREE powerful click tracks. (You'll get the standard click tracks and you're also getting one of the important enhanced effectiveness PSTEC tracks included. Play your tracks with ease and in comfort. Lots of people struggle with computers and MP3s so this is also the perfect gift for friends or family that don't have an MP3 player. Get it for someone you care about. Also available: "Success With PSTEC & PSTEC Positive On CD" and "The PSTEC Therapy Guide"
This means you can play this through a Portable Stereo, Home Stereo, CD Player, CD Walkman, or use a DVD player to listen through your TV. Hint: PSTEC works best when played through proper speakers as suggested above. We have received emails from many people that are struggling with computers and MP3s. This is also a much better way to give the perfect gift of PSTEC to friends and family… for everyone you care about. This CD is also included in the PSTEC Level 1 Package on CD … get the Level 1 Package and save! 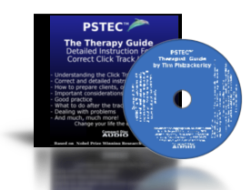 CD #1: PSTEC Therapist Guide on CD. Whether you are a therapist working with others or a self helper, a deeper understanding of the Click Tracks will serve you well and that’s what’s included here. Almost an hour of instruction from Tim Phizackerley, Creator of PSTEC. Whether you are a therapist working with others or a self helper, a deeper understanding of the Click Tracks will serve you well and that’s what’s included here. Almost an hour of instruction from Tim Phizackerley, Creator of PSTEC. The following 2CD Packs include identical CD’s. Perfect for you and a friend or family member. This is a 2 CD pack with identical CD’s so you can have one and also share the other with a friend or family member. Save $10.00 (over 17%) on the single CD Price!